A German court approved Hamas flags at anti-Israel protests this week. A court in the German capital struck down an administrative ban on Hamas flags, clothing and banners on Friday, but left in place the ban on invoking Hamas Foreign Minister Mahmoud Zahar’s call to murder Israeli children worldwide. Meanwhile… The German police are banning Israeli flags. 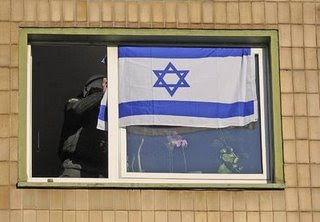 The pro-Hamas protesters cheered “Alluha Akbar” as the German police ripped the Israeli flag out of the window. …When asked if the Duisburg police plan to confiscate Israeli flags from supporters who demonstrate against an anti-Israeli protest slated for this coming Saturday, Ramon van der Maat, a Duisburg police spokesman, told The Jerusalem Post that, “we have to see what is expected” at the protest, adding, “It depends on the situation and one cannot, across the board” say that Israeli flags will be permitted. Ed Driscoll said that things are starting to look a lot like 1942 lately.